I have found that a key ingredient of a simple pleasure is one’s perception of time. To truly enjoy a thing, one has to be fully present in the moment. On my recent visit to Yellowstone National Park, I was reminded of this idea. The beauty of the natural resources, wildlife, and geothermal features is, for lack of a better word, breathtaking. I really had no idea what to expect; this park is indeed a national treasure. As you drive and hike through the park, you find that your senses are constantly stimulated; there is always something brilliant to see. The beauty of nature unfolds before you. 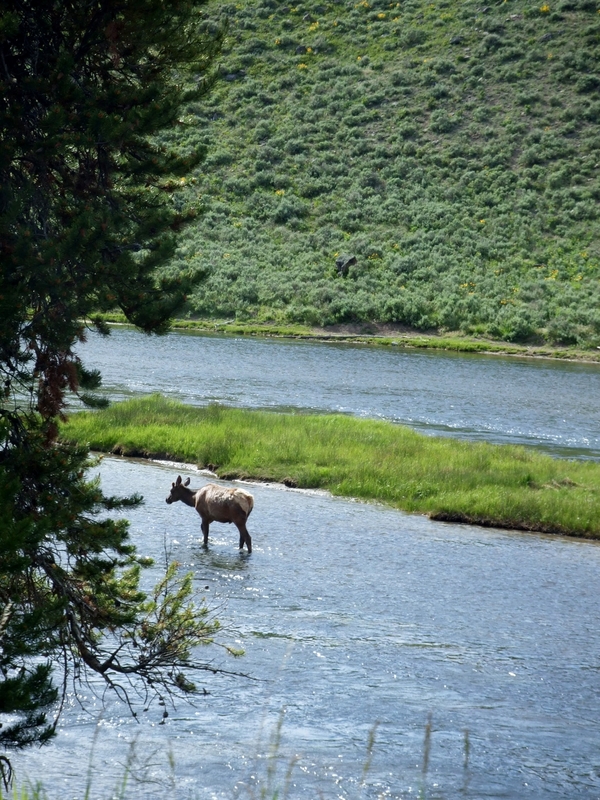 While Yellowstone is situated on an active volcano, ironically, it is a calming effect that is elicited from being in the park. Nowhere is this more evident than when you breeze through the park’s roads, only to be stopped by a traffic jam. And why, you wonder, is there a traffic jam and, how exactly can this be evidence of a calming effect?? Well, the traffic is stopped because someone has spotted wildlife in its natural habitat and that is exciting. 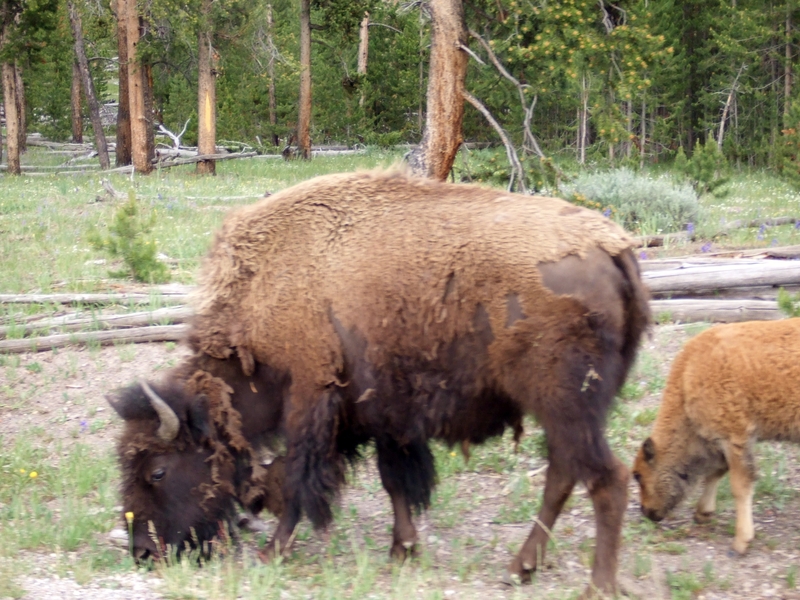 To see an elk, coyote, or bison, for example, in close proximity is like finding a prize. Once someone stops, then the procession of cars behind him or her stops, one at a time, to pull over to get a look. Sometimes there is not a sufficient place to pull aside, so the cars just stop on the road. And everyone gets out or pulls down a window to shoot the wildlife they see – not with guns, but with cameras. Everyone wants to capture the photo of a lifetime in this place of natural beauty to take home a treasured piece of his/her experience. And the curious thing about the whole scene is that no one gets angry about the traffic jam. Back home, I would expect horns honking and choice words flying, but here there is an acceptance that this is part of the experience and that we are here to enjoy the moment. No worries, no cares, no deadlines or places to get to. That is, I suppose, the essence of a simple pleasure! 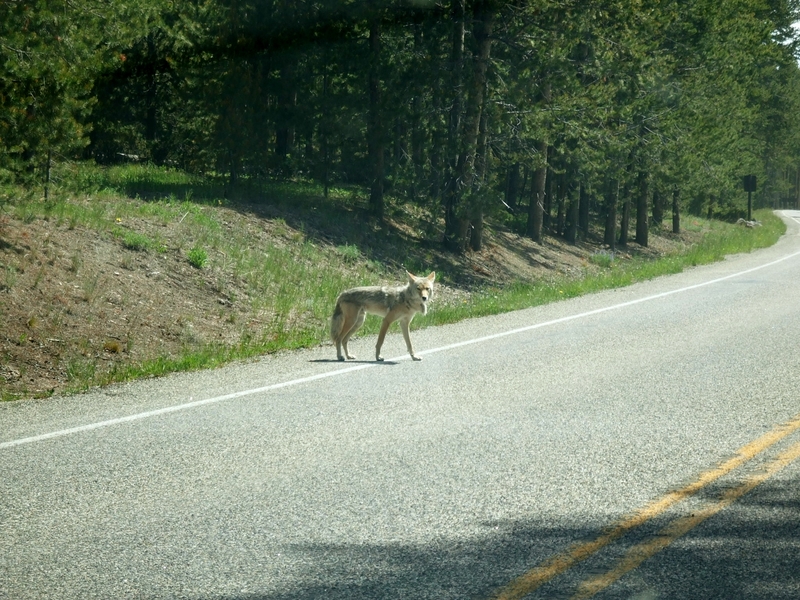 Here are some photos I took of wildlife my husband and I saw as we drove through Yellowstone. Not great photos (really difficult to shoot from the passenger side as you are coasting by), but memorable for us. Bison are frequently spotted along roadsides in certain areas. Not certain of what this one is – maybe deer or elk?